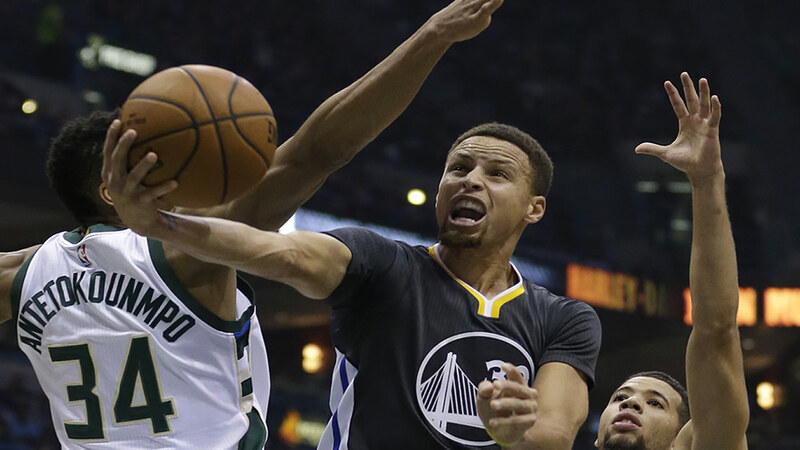 MILWAUKEE -- The streak is over for the Golden State Warriors. Their NBA-record start ended after 24 wins when the Milwaukee Bucks beat them 108-95 on Saturday night. Ironic that Bay Area star Jason Kidd's Bucks beat Warriors. Bucks also ended Lakers 33 game win streak in 1971. The Buck stops here. Golden State fell to 24-1. Its 28-game winning streak, counting the final four games of last season, came to a halt. The NBA's longest winning streak was 33 by the Los Angeles Lakers in 1971-72 - and it was also snapped by Milwaukee. Greg Monroe scored 28 points for the Bucks, who got the all-around effort needed to beat the defending NBA champions. It also helped that the Warriors, perhaps fighting fatigue after needing two overtimes to win at Boston on Friday, were cold from 3-point range. They usually make 13 a night, but were just 6 of 26 from behind the arc playing on the final game of a seven-game road trip. Stephen Curry had 28 points on 10-of-21 shooting from the field, including 2 of 8 from 3-point territory. Not good enough to get past the Bucks, who led by double digits for much of the night before the Warriors cut it to a point a couple times. The Bucks had an answer each time. Monroe was 11 of 16, including a three-point play with 2:51 left for a 12-point lead. Michael Carter-Williams' strong drive down the lane and dunk with 42 seconds left put an exclamation point on Milwaukee's night. Giddy Bucks fans at the packed Bradley Center erupted with cheers after the final buzzer. A raucous Bucks cheering section proved prophetic after wearing green "24-1" shirts to the game. Giannis Antetokounmpo finished with 11 points, 12 rebounds and 10 assists, while Carter-Williams had 17 points off the bench. Draymond Green had 24 points and 11 rebounds for the Warriors. Klay Thompson, returning after missing a game with a sprained ankle, had 12 points on 4-of-14 shooting. The Warriors trailed 59-48 at halftime after shooting 2 of 13 from 3-point range. It was just the fourth time this season that Golden State trailed at the half. Warriors: C Andrew Bogut, who was drafted first overall by the Bucks in 2005, finished with two points. He's even more important to Golden State on the other end of the court. "He's one of the best defensive centers in the league, he's one of the most skilled centers in the league," interim coach Luke Walton said. Bucks: PGs Jerryd Bayless and Greivis Vasquez remained out with ankle injuries. ... Milwaukee shot 6 of 9 from 3-point range in the first half, led by four from O.J. Mayo.